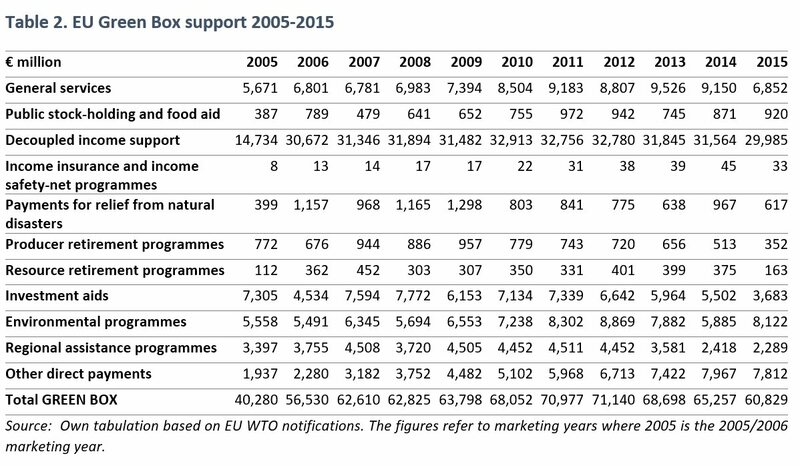 The EU submitted its latest domestic support notification to the WTO for the 2015/16 marketing year on 23 August last. This notification is interesting because it covers the first full year of operation of the new CAP in 2015, as the new direct payments architecture was first implemented in that year. This post examines the trends in domestic support in this and recent notifications, and speculates on how the figures might be affected by the Commission’s legislative proposals for the CAP announced on 1 June last. 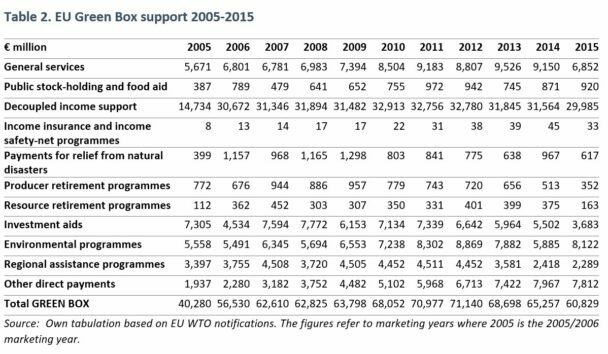 The broad trends in domestic support provided to EU agriculture according to the WTO classification is shown in the Figure below. Domestic support under the WTO Agreement on Agriculture is the sum of (a) expenditure on general services that provide benefits or services to agriculture and the rural community, (b) support (expressed in monetary terms) provided for agricultural products that benefit agricultural producers, as well as (c) non-product-specific support provided in favour of agricultural producers in general. Domestic support is broadly divided into non-trade distorting (Green Box) support and trade-distorting support. Government services and certain types of producer support that meet criteria set out in Annex 2 of the Agreement on Agriculture are counted in the Green Box. Trade-distorting support is defined as the sum of product-specific and non-product-specific Aggregate Measurements of Support (AMSs), calculated as the sum of market price support (calculated in a specific way, see this post by Lars Brink) and budgetary payments associated with individual products or paid to producers in general. The sum of a country’s trade-distorting support is called its Current Total Aggregate Measurement of Support (CTAMS). In calculating this amount, countries can exempt certain types of trade-distorting support in addition to Green Box non-distorting support. The two exempted categories for developed countries are production-limited support which meets certain additional criteria (known as Blue Box payments) and de minimis support. The latter is trade-distorting support that is deemed to be sufficiently small that it does not have to be included when summing AMSs across products and any product-specific-support to calculate the CTAMS. For developed countries, an AMS smaller than 5% of the value of production for a product or for all production is treated as de minimis and is excluded from the calculation of the CTAMS. Members agree to keep their trade-distorting support calculated in this way below the bound level (Bound Total Aggregate Measurement of Support, or BTAMS) to which they committed when they signed up to the Agreement on Agriculture at the end of the Uruguay Round (or at the time of their accession to the WTO in the case of countries that joined since then). This CTAMS is often referred to as Amber Box support although, as is also the case for the Green and Blue Boxes, these terms do not appear in the Agreement on Agriculture itself. 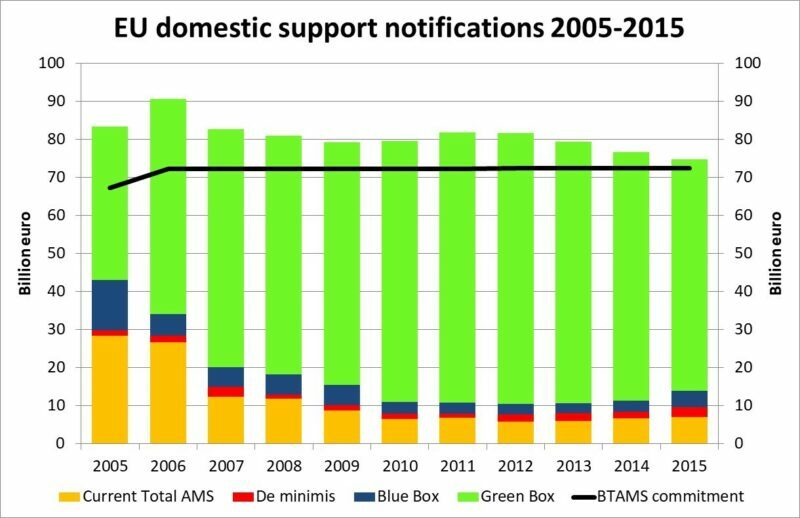 Thus, the Figure below decomposes total EU domestic support into four components (a) Amber Box support (Current Total AMS), (b) de minimis trade-distorting support (c) Blue Box support and (d) Green Box support. In addition, it shows the EU’s BTAMS commitment. This has increased slightly with successive enlargements of the EU as the EU has added the BTAMS commitment of new Member States to its own BTAMS. Source: Own presentation based on EU WTO notifications. Note that the figures refer to marketing years, so that 2005 refers to the 2005/06 marketing year. Overall EU domestic support (measured using the metrics set out in the Agreement on Agriculture) has averaged around €80 billion per annum with a slight reduction in recent years. The most obvious message from this figure is that the EU’s Amber Box support is way below its committed ceiling. This means that the EU could significantly increase its trade-distorting support without breaching its WTO obligations. A second observation is that EU trade-distorting support (the sum of its Amber Box, de minimis and Blue Box support) has steadily fallen since 2005, although there is some evidence that it started to increase again in the last two years of notification. This reflects the reduction and elimination of market price support for individual products as part of the move towards greater market orientation during this period. Trends in the individual components of this figure are now discussed in greater detail. Recent trends in Amber Box support are shown in Table 1. EU Amber Box support derives mainly from market price support due to administrative support prices set for mandatory public intervention for three products – common wheat, skimmed milk powder and butter. Non-product-specific AMS is always reported as zero under the de minimis rule. The 2015 notification also includes over €1 billion provided as extraordinary support measures (to milk, beef, sheep, pigmeat and fruits and vegetables) but in all cases this support is not counted in the Amber Box as it is excluded under the de minimis rule. Public intervention is also possible for a range of other products under the Single Common Market Organisation (CMO) Regulation (EU) 1308/2013. While public intervention is automatically open for common wheat, SMP and butter during specified intervention periods, it depends on a specific Commission proposal to open intervention for the other commodities. Public intervention has not been used for these other commodities in recent years (with private storage aid being the preferred alternative to stabilise markets when necessary). Council Regulation (EU) 1370/2013 makes a distinction between reference prices laid down in the Single CMO Regulation and intervention prices. It specifies that only intervention prices for public intervention correspond to the applied administered prices used to calculate market price support in the Agreement on Agriculture. The Regulation notes that market intervention may occur for other agricultural products but this is not on the basis of ex ante fixed price indications (e.g. intervention may take place on a tendering basis) so is not required to be notified under WTO rules. WTO rules in the Agreement on Agriculture require market price support to be calculated as the product of the difference between the product’s intervention price and a fixed external reference price (the price gap calculated according to the methodology set out in the Agreement on Agriculture) multiplied by the quantity of production eligible to receive the intervention price. The EU calculates the market price support for product AMSs for the three products with mandatory public intervention by multiplying the price gap by total production of these products. The gradual increase in the CTAMS in recent years is due to higher levels of production of these intervention products. The amounts eligible for public intervention at the fixed intervention price are limited to much less than total production. Beyond these limits, intervention is carried out by means of a tendering procedure to determine the maximum buying-in price. Some WTO Members calculate market price support in this situation by multiplying the price gap by the production eligible for the fixed price support rather than total production. This is not the approach used by the EU. However, for the products where opening intervention is at the discretion of the Commission, the EU has notified eligible production as zero given that intervention support has not been opened in these years. In 2018, the Commission set the ceiling for intervention purchases for skimmed milk powder at zero to avoid public intervention taking place with no market justification (as both butter and farmgate milk prices were at reasonably high levels). Public intervention in 2018 operated only through a tendering procedure. When the Commission notifies the SMP AMS in its 2018 notification, it will be interesting to see whether it continues to use total production or zero production in calculating this AMS. Public intervention is also available for beef but the administrative support price (the safety-net intervention price) was for many years below the fixed external reference price giving rise to a negative price gap. Prior to the 2013 CAP reform, intervention had to be opened if the average market price was below 1560 EUR/t for the type of beef meat eligible for intervention buying. Thus the EU reported eligible production as total production but, because of the negative price gap, the beef product AMS was notified as zero. In the 2013 CAP reform, the beef intervention price was increased. From the 2014 notification on it exceeds the fixed external reference price, so there is now a positive price gap. However, there is no longer an automatic obligation on the authorities to buy beef meat into intervention. The new Single CMO Regulation provides that if the market price falls below 85% of the reference threshold price then the Commission may open a tender to buy beef meat for the types of meat that qualify for intervention. As a consequence of this change in the legal framework, and because public intervention for beef was not opened in 2014 or 2015, the eligible production was notified as zero and there was a zero AMS for beef. The EU notifies around €60-70 billion as support that is exempted from the WTO disciplines on trade-distorting support due to meeting the criteria set out in Annex 2 to the WTO Agreement on Agriculture (Green Box). The trend in this support is shown in Table 2. The single biggest item is decoupled income support notified under Paragraph 6 of Annex 2. This item first appeared in the 2005 notification when the Single Farm Payment was first paid to farmers mainly in the older Member States following the 2003 Mid-Term Review CAP reform. Some Member States delayed their introduction for administrative reasons so the total notified increased again in 2006 and has remained stable since then. For the most recent 2015 notification, there is an ambiguity around the numbers notified arising from the fact that the EU refers to the decoupled payments in 2015 as the Single Payment Scheme paid under Regulation (EU) No 1307/2013. However, this Regulation introduced the new structure of direct payments following the 2013 CAP reform with effect from 1 January 2015. The Single Payment Scheme authorised by Regulation (EU) 73/2009 continued to form the basis on which income support was granted to farmers in 2014. When the EU notified the WTO of the changes in its direct payments scheme in 2017 (in WTO document G/AG/N/EU/35), it noted that “Regulation (EU) No 1307/2013 applies from application year 2015”. Under the 2013 Regulation, the Single Payment Scheme was replaced by the Basic Payment Scheme plus the greening payment and other targeted payments. But there is no reference to these schemes in the EU’s 2015 notification. In notifying the new direct payments architecture to the WTO in 2017, the EU listed each of the individual schemes (basic payment, greening payment, small farmer payment, redistributive payment, payment for young farmers, payment for areas with natural constraints) and made the case that each scheme was a decoupled income support without a requirement to produce. When it notified the Single Area Payment Scheme (see below), the Commission noted that “The payments linked to greening, young farmers, small farmers, natural constraints and redistributive payments in the countries using SAPS will be notified together with SAPS payments.” It may be that it opted for the same approach and intended to notify the totality of payments exempted under Article 6 under the Basic Payment Scheme. However, the continued reference to the Single Payment Scheme in the 2015 notification without reference to the individual schemes notified to the WTO in 2017 means the notification is at a minimum confusing, not least to other WTO Members. Decoupled payments under the Single Area Payment Scheme (SAPS) in ten of the new Member States that acceded to the EU after 2014 are notified as ‘Other direct payments’ under Paragraph 5 of Annex 2. Where decoupled income support notified under Article 6 must “be determined by clearly-defined criteria such as income, status as a producer or landowner, factor use or production level in a defined and fixed base period”, this criterion is not necessary for direct payments notified under Article 5. These payments have steadily increased over time reflecting their phasing in over a period of years following the accession of the EU Member States using this scheme. Finally, note the very small amounts notified under income insurance and income safety-net programmes. 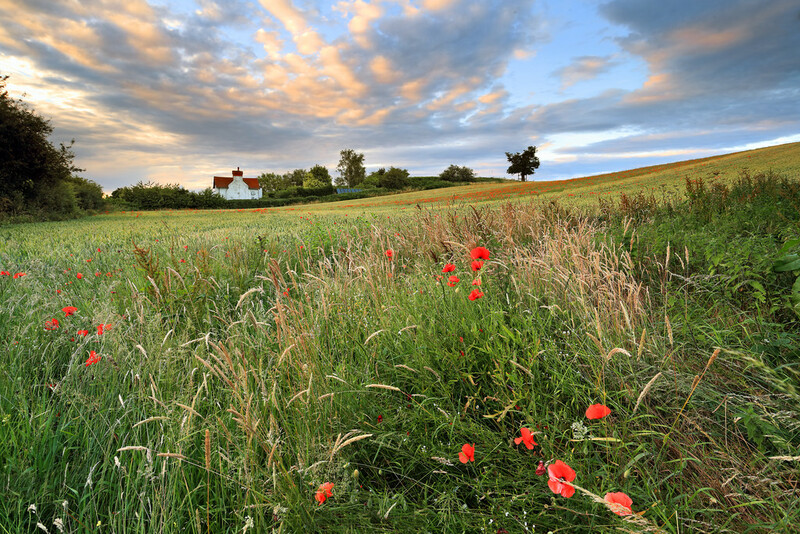 The 2013 CAP reform introduced a risk management toolkit in Pillar 2 which allowed Member States to subsidise certain types of insurance in their rural development programmes. The regulation was drafted such that eligible schemes met the criteria for exemption from WTO disciplines under Paragraphs 7 and 8 of Annex 2 of the Agreement on Agriculture (specifically, that only income and production losses greater than 30% can be covered and, in the case of income loss, a maximum of 70% of the loss can be indemnified). Few Member States availed of this option. The Omnibus Agricultural Provisions Regulation (EU) 2017/2393 lowered the threshold for production and income losses to 20% to make these schemes more attractive to Member States, and also introduced the possibility of sector-specific income stabilisation tools. This means such payments would have to be notified as Amber Box support in future as they would no longer meet the criteria for exemption under Annex 2. The EU also notifies Blue Box payments under Article 6.5 of the Agreement on Agriculture. This Article exempts payments under production-limiting programmes from reduction commitments provided either (a) such payments are based on fixed areas and yields, or (b) such payments are made on 85 per cent or less of the base level of production, or (c) livestock payments are made on a fixed number of head. The trend in the EU’s Blue Box payments is shown in Table 3. Notified Blue Box support reached a low point in 2013/14 when the limitations on coupled supports introduced in the 2008 Health Check were most effective. At this point, coupled payments had two different legal bases. Some were a carry-over from the partially-coupled payments introduced under previous CAP legislation. These included crop payments to cotton and bananas, and livestock payments confined to suckler cows, ewes and goats. The other legal basis was known as ‘Article 68’ payments which allowed Member States to use up to 10% of their Pillar 1 direct payment ceilings for specific support to sectors of farming with particular difficulties (with a limit of 3.5% of the national ceilings) as well as support to quality production. The key provision to be exempt under Article 6.5 is that the payments are production-limiting. The EU implements this by requiring in the relevant regulation (Commission Delegated Regulation (EU) No 639/2014) that areas and yields and number of animals shall be fixed by the Member States at regional or sector level at the maximum yields, area cultivated or number of animals reached in the targeted region or sector in at least one year in the period of five years prior to implementing a coupled scheme. The unit amount of support is then derived as the ratio between the amount fixed for the financing of the measure and either the area or the number of animals eligible for the support. How Member States limit payments to the maximum area or number of animals is unclear. Australia has posed exactly this question to the EU in the WTO Committee on Agriculture and the response of the EU will be given at the next Committee meeting. When similar limits were applied under the MacSharry CAP reforms, these limits were allocated to individual farms. If farmers exceeded their eligible area or number of animals, no payments were made. But farm-level limits do not apply in the case of the new VCS schemes. As one example, Ireland applies a coupled payment for protein crops. The rate of payment is set once the eligible area is known. Scotland uses coupled payments for suckler beef and upland sheep. Again, in both schemes, estimated payment rates are given but actual payment rates depend on the total number of eligible calves or hoggs claimed. I suspect this practice is widespread for coupled support schemes across the EU, where the limit applied is the financial ceiling but not a fixed area or number of animals. Whether this way of implementing the scheme is compatible with Article 6.5 is open to question. However, this question is now moot because of the changes made to the VCS schemes in the Omnibus Agricultural Provisions Regulation (EU) 2017/2393. As I previously noted in this post, one of the amendments in that Regulation removed the requirement that coupled support may only be granted to the extent necessary to create an incentive to maintain current levels of production in sectors or regions of a Member State where specific types of farming or specific agricultural sectors that are particularly important for economic, social or environmental reasons undergo certain difficulties. Instead, coupled support is now defined as “a production-limiting scheme that shall take the form of an annual payment based on fixed areas and yields or on a fixed number of animals and shall respect financial ceilings to be determined by Member States for each measure and notified to the Commission”. In other words, there is no longer any ceiling on the fixed area or number of animals to which coupled payments may apply. Furthermore, the Regulation notes that, as this reformulation reflects the current practice since 1 January 2015 regarding the provisions concerned (confirming my view that Member States in practice were either unable or unwilling to limit payments to a fixed area or number of head) the Regulation specifically backdates this change to that date. For this reason, it will be hard to claim that coupled payments can continue to be exempt under Article 6.5 of Annex 2. If the Commission follows this advice and notifies VCS in the Amber Box, it will presumably have to submit a revised notification also for 2015. The draft Regulation on CAP Strategic Plans makes conscious reference to the EU’s WTO obligations. To ensure that the proposed new architecture of direct payments continues to be notified as Green Box support which has no, or at most minimal, trade-distorting effects or effects on production, the framework definition for ‘agricultural activity’ provides for both the production of agricultural products or the maintenance of the agricultural area. There is an entire Article (Article 10) devoted to ensuring that Member States show how the interventions they include in their CAP Strategic Plans are consistent with the relevant provisions of Annex 2 (Green Box) to the Agreement on Agriculture. The Commission expects that the various direct payment schemes intended to provide income support will continue to be notified under Paragraphs 5 (direct payments to producers) and 6 (decoupled income support), depending on whether Member States choose to make use of entitlements in the implementation of these payments or move to the area-based payment model currently adopted for SAPS. Questions have been raised whether the EU schemes, and particularly SAPS, meet the criterion in Annex 2 that “The amount of such payments in any given year shall not be related to, or based on, the factors of production employed in any year after the base period”, but the Commission’s response has always been that, because no production is required to receive payments, they are compliant. Payments under the eco-scheme funded within Pillar 1 will also be notified under these paragraphs except for payments granted to farmers not eligible for the basic income support for sustainability, in which case they will be notified under Paragraph 12 Environmental Programmes. What is novel about the eco-scheme is that it opens the possibility that Member States can grant support to beneficiaries for environmental or climate practices in two ways. They can either compensate for all or part of the additional costs incurred and income foregone as a result of the commitments undertaken, or make a payment top-up to basic income support. Only compensation based on the first criterion can be notified under Paragraph 12 of the Green Box. It is thus clear that, where compensation takes the form of the income top-up, it cannot be notified under Paragraph 12. The Commission proposes to notify it under Paragraph 5 or 6. Here the problem may arise if eco-payments are linked to specific forms of production (e.g., payments to maintain permanent pasture). 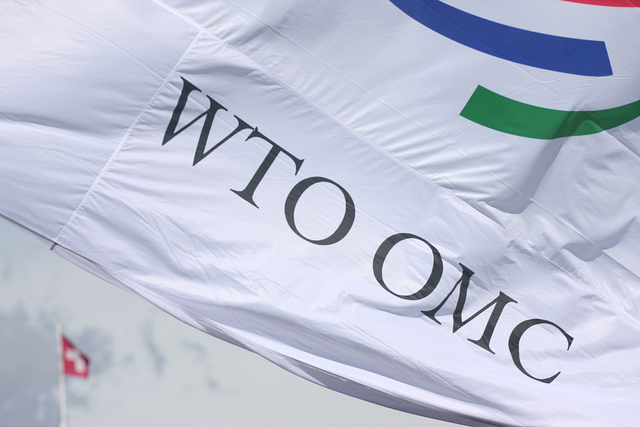 The Commission takes the view that no WTO Member is likely to challenge the scheme. “It should be noted that the purpose of eco-schemes is not to enhance production but to enhance delivery on environmental objectives. The effect of these schemes is therefore most likely to provide a production constraint or to have a certain influence on the type of production chosen rather than an overall production stimulating effect” (Impact Assessment Part 3, p. 69). The Commission has recently updated its notifications to the WTO on domestic support to include the 2015/16 marketing year. Overall measured domestic support amounts to just less than €80 billion annually. The great majority of this support takes the form of Green Box measures that are not subject to any limitation. The EU’s use of non-exempted trade-distorting support (measured by its Current Total Aggregate Measurement of Support) is only a tiny fraction of its commitment ceiling. The departure of the UK from the European Union will not change this assessment, even though it will lead to some reduction in the EU’s BTAMS ceiling which sets the maximum allowed amount for certain types of trade-distorting support. However, changes introduced since the 2013 CAP reform mean that the EU’s use of trade-distorting support has been increasing, even if it remains well below its commitment ceiling. Not all these changes have yet appeared in the EU’s notifications, and will only become apparent with time. The most significant change in monetary terms will be the reclassification of some coupled supports from Blue Box to Amber Box. Because coupled support to some commodities may be deemed de minimis, we cannot assume that all the Blue Box support currently notified will become Amber Box support. The Commission estimates that between €2-4 billion may be added to the EU’s notified Amber Box support in future as coupled support. Some additional amounts may also be added if Member States make greater use of the risk management toolkit in future. However, the new eco-scheme will continue to be classified as a Green Box measure, albeit as compliant income support rather than as an environmental programme. The WTO as an institution is under enormous pressure now, arising from the US use of tariffs to pursue national economic advantage, from the inability of current rules to address China’s continued non-market economy status, and from the US veto on appointing judges to the Appellate Body. The EU portrays itself as a strong defender of the multilateral system. Even if its use of trade-distorting measures in agricultural support is well below what it is permitted (based on its historical use of such measures), it is disappointing to see the trend moving in the wrong direction. It undermines the EU’s credibility and gives support to the criticism of the many developing countries whose use of trade-distorting support cannot exceed de minimis levels that the WTO rules are biased in favour of the rich and powerful.